Violent Spaces. Violent crime in city parks has increased twenty-three percent over the last nine months as compared to the previous nine months. This is the first time comparative crime statistics for parks are available over a nine month period. 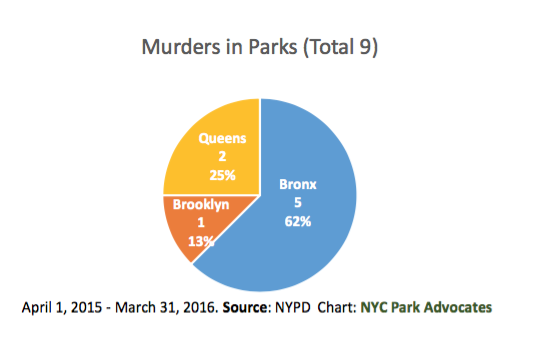 Statistically a violent crime is reported more than once a day in a New York City park. Violent crime in parks have soared over the last nine months according to the latest figures complied by NYPD and analyzed by NYC Park Advocates. Violent crime increased twenty-three percent compared to the previous time period. Although overall crime in parks rose 2.97 % during this reporting period violent crimes increased dramatically. 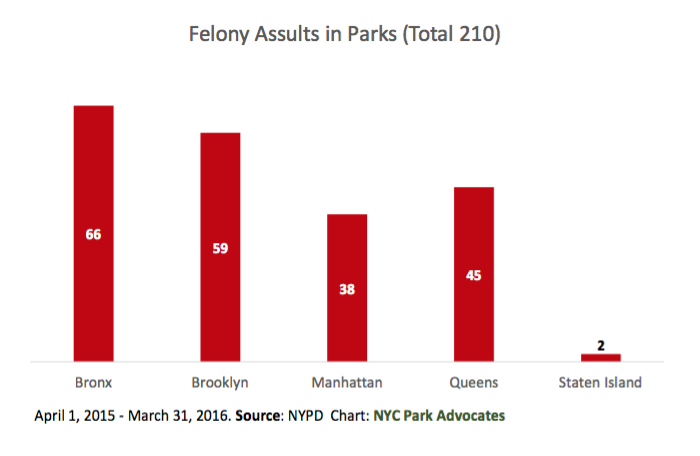 Four hundred and seventeen people reported being the victims of violent crimes in city parks over the last nine months compared to three hundred and forty over the previous period, an increase of twenty-three percent. Over the last nine months 6 people were murdered, 14 were raped, 254 people were robbed, and 143 were victims of felony assaults. As a comparison 2 people were raped, 10 were murdered, 221 were robbed, and 107 were victims of felony assaults over the previous nine month period. Statistically a violent crime was reported 1.14 times a day according to the latest figures available. 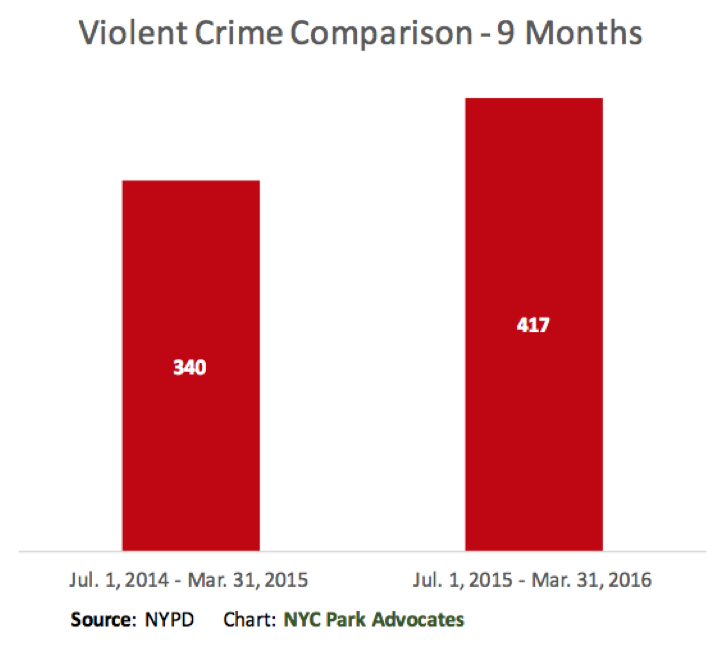 The statistics cover an eighteen month period from July 1, 2014 through March 31, 2016, the latest park crime data released by the NYPD. 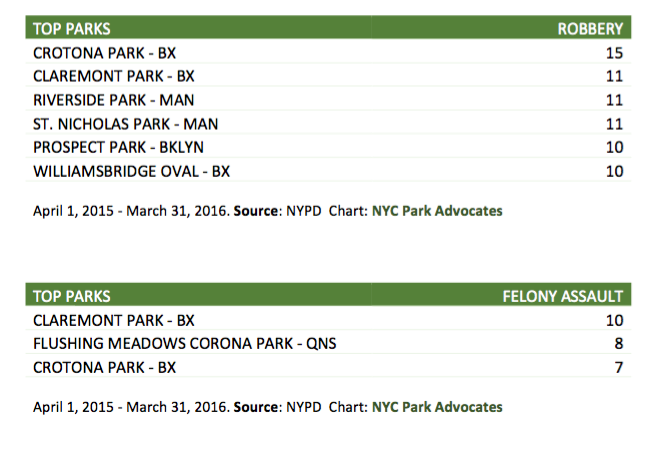 This is the first time comparative crime stats for parks are available for a nine month period. 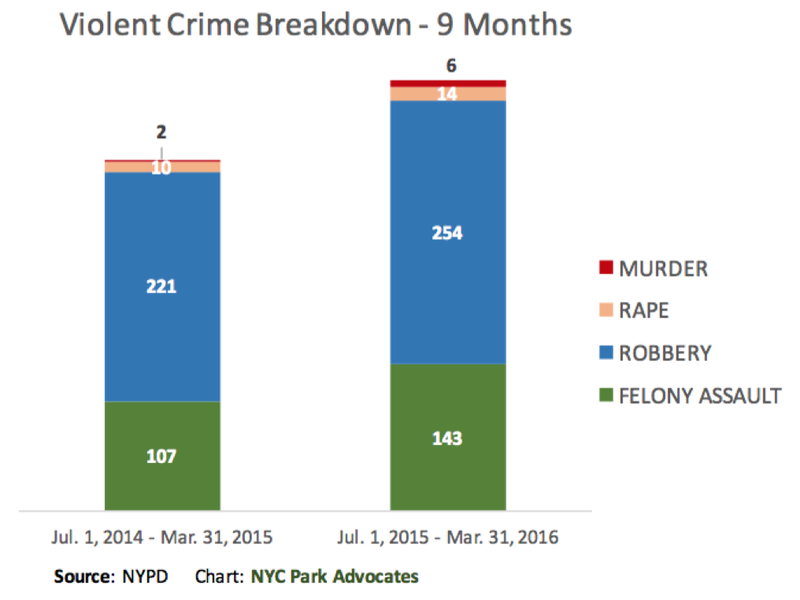 The striking figures come from the latest crime data tracked by the NYPD under a 2014 law. The NYPD is now compiling crime data from 1,155 park properties, up from just 31 parks police began tracking in 2008. 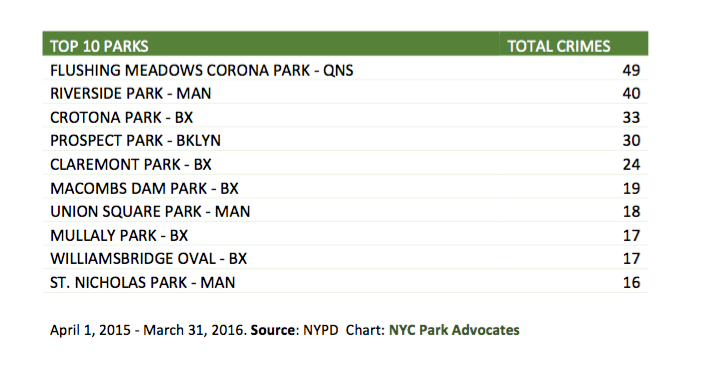 The figures do not include Central Park which has its own police precinct. 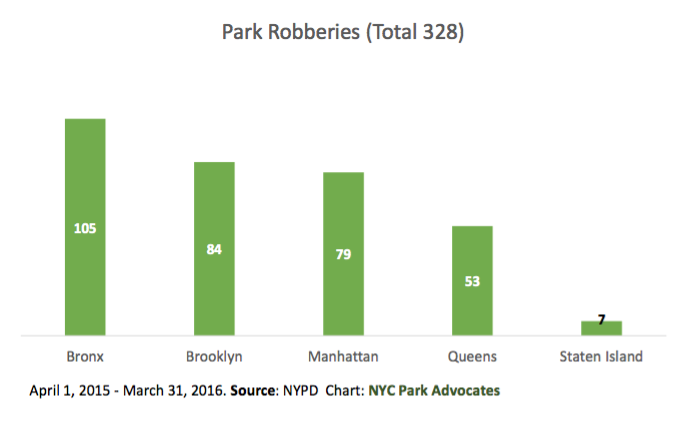 Park crime for the seven major crime categories jumped twenty-seven percent in the first quarter of 2016 alone - 108 vs. 85 during the first quarter of 2016 compared to the same period last year. Felony assaults during the first quarter 2016 more than doubled and grand larcenies nearly doubled. Violent crime rose seventeen percent, 53 vs. 62 in the 1st quarter to 1st quarter comparison. This data covers the periods January 1st - thru March 31, 2016. 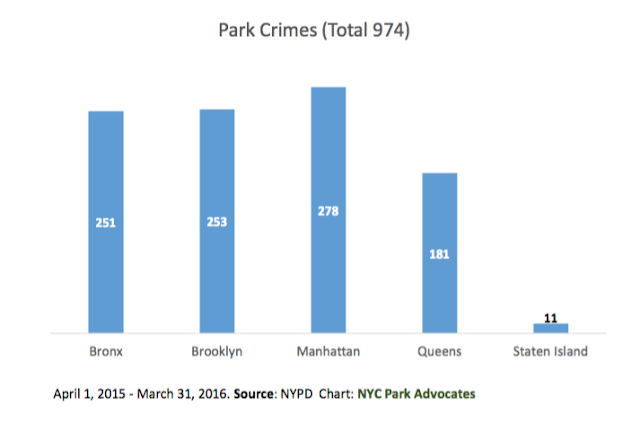 The De Blasio administration has repeatedly sought to downplay crime in parks. For years park safety advocates have called on the city to dramatically increase the number of park police but they have refused. Over the last year 9 people were murdered, 328 people were robbed, and 210 were victims of felony assaults. 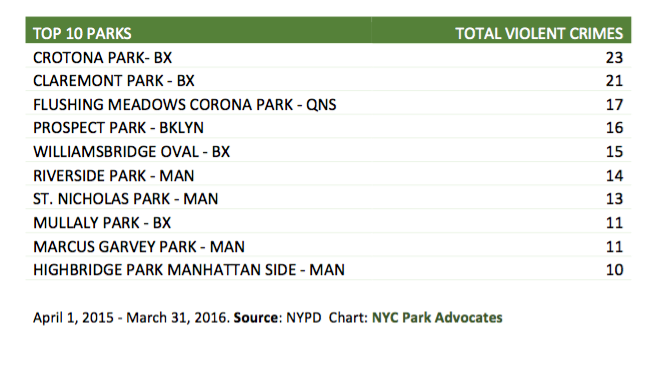 These statistics cover a twelve month period from July 1, 2015 through March 31, 2016, the latest park crime data released by the NYPD. 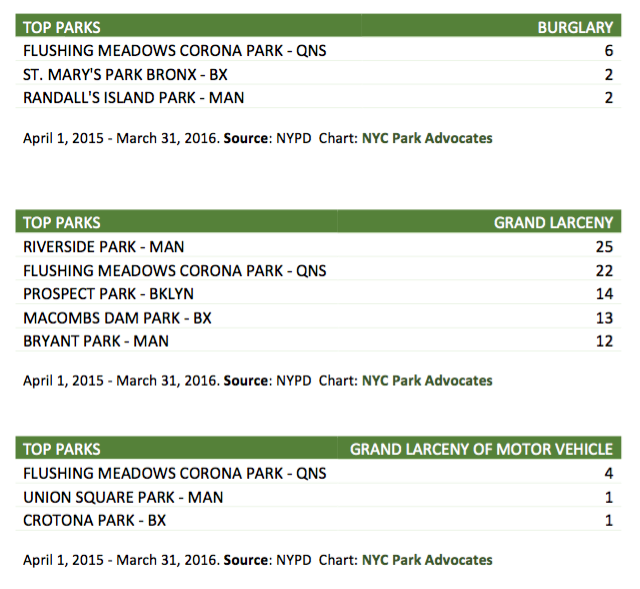 when the overall NYC crime statistics are formulated , are these park statistics included?